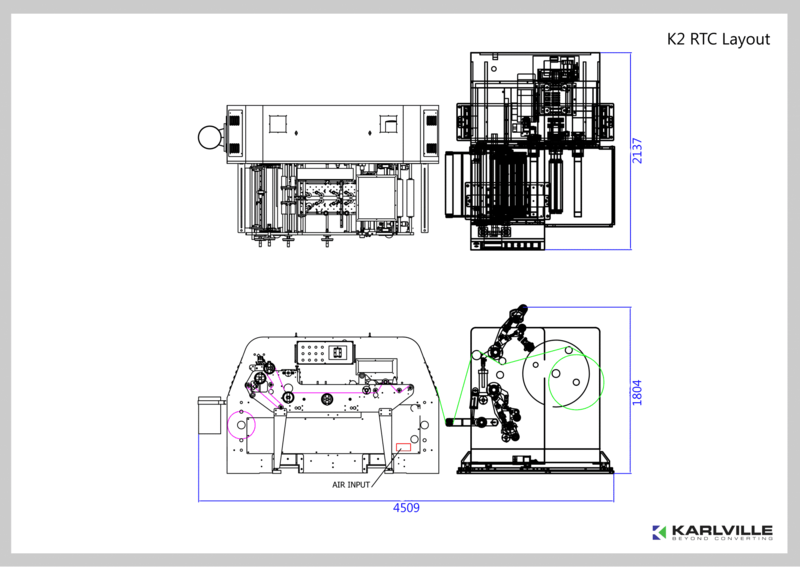 Our K2 RTC model is based on our most popular standalone K2 machine. The K2 RTC machine operates at 300 meter per minute and forms the sleeves via an adjustable forming section. A Rewind Turret Cantilever (RTC), seamlessly integrates to K2 for increased production, decreased production cost, decreased waste and increased quality control. The machine is available in 300mm and 400mm lay-flat models. The machine features fast changeover rewind and unwind air shafts. For non-stop operations, we recommend the machine to be configured with options such as the QC Package, Open Seam Detector, Unwind Perforation & Micro Edge Guide for Solvent Needle. This machine is ideal for flexographic converters that started initially with a K2 and looking to take business to the next level. Our customers are companies with fast growing operations in the market. Never forced side to side for oscillation. Even with turrets; complete turret moves back and forth on heavy duty linear bearings. Direct Injection Needle Type Solvent Application with Proportional Solvent Controlled Integrated to PLC. Our team truly understands business; cross trained in Sleeve Application. Karlville Technicians are considered among the best in the Shrink Sleeve Business. Lay Flat Measuring System allows Operator to Input Tolerance Range; if Outside of Set Tolerance Range Alarm is Triggered. Sensors Automatically See Film and Move into Position. Open Seam Detector detect un seamed material via UV sensor at 300-500 meters per minute. 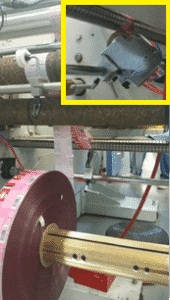 Fiber Optic Sensor works along with Stepper Motor to align the solvent needle to the edge of the film. Excellent Needle Positioning– This innovative device allows for excellent needle positioning without the worry of micro movements caused by roll changes, splices or slitter stops. Micro Edge Guide– At 300 M/MIN, the micro edge guide will make quick movement to keep solvent at film edge. Device Origin– This device was originally created for converters that ran blown film with uneven thickness and edges. NO Longer Need to Stop due to Adjust Needle– Operators are continually adjusting the placement of the needle to the edge of the film. Operators worry about micro movements that will place the solvent inside or outside the required placement. Your operator will no longer need to adjust needle during each roll change, splice or slitter stops as the device automatically adjusts to the required edge.